We carry an assortment of trailer adapters and connectors to outfit all types and capacities of trailers. Whether you have a Boat Trailer, or Land Trailer, we should have the part that you need. Some of the items below are hard-wire connectors for re-wiring up your trailer, and some are adapters. Boat trailer adapters are very convenient to have nearby when towing several different types of trailers with the same vehicle is common. 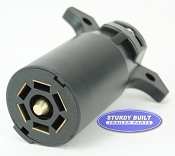 At Sturdy Built Trailer Parts, we always carry the widest selection of all the superior quality trailer parts you need, and always at affordable prices. From the largest trailer components to the smallest part or accessory, you'll always find it right here. Our collection of trailer adapters and connectors is wide enough to outfit all types and capacities of trailers, no matter whether you're working on a boat trailer, Jet Ski trailer or utility work trailer. From hardwired connectors for re-wiring up your trailer to adapters for working with existing connections, we have all of the configurations, both trailer side and vehicle side to provide you with the versatility you need, even when towing several different types of trailers with the same vehicle.